Pre cook lentils, drain, cool and reserve. Saute red onions in warm olive oil until translucent. Add garlic, turmeric and cumin. 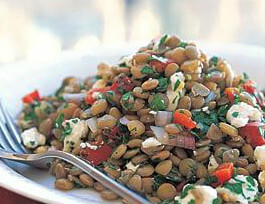 Mix lentils, onions and rest of ingredients together. Add cilantro and lime juice. Serve.